Alanna Demetrius | The Phoenix The demolition process began at Loyola's Almuni House to make way for a new residence hall slated for completion in 2020. Despite months of protest and petitioning, demolition is underway on Loyola’s Alumni House as grounds are readied for a new $47 million residence hall set to open in 2020. 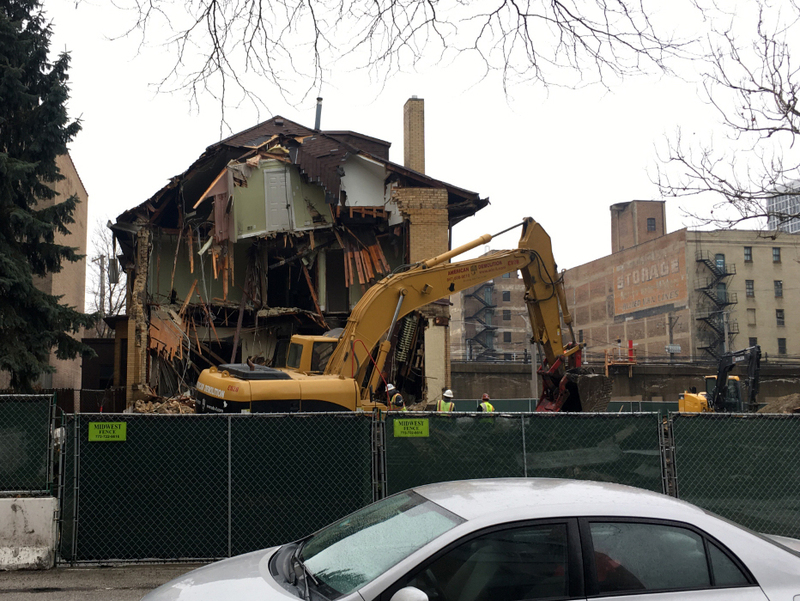 The demolition is expected to last a week, after which a six to eight week destruction process will begin on the neighboring apartment building, according to Loyola’s Department of Residence Life. The plans to demolish Alumni House and a Loyola-owned apartment building — both on North Winthrop Avenue near Regis Residence Hall — have drawn criticism from local Edgewater Historical Society, which cited concerns relating to the environment and reduction of affordable housing in the area. However, in a past statement to The Phoenix, Loyola said construction plans would include safety and environmental precautions. The statement also noted the average rent of units within the apartment building was near Edgewater’s overall average cost. At market rate, the apartment isn’t categorized as “affordable,” the university said. Leroy Blommaert, co-chairman of the historical society’s historic sites committee, said he was disappointed in Loyola’s decision to move forward with the project. “Yes we are saddened, not surprised,” Blommaert said. He said he isn’t aware of any further plans in opposition of the two buildings’ demolition. “The fences are up, the contract is signed and I don’t think there will be any last hour reprieve,” Blommaert said. However, he said the society may be vocal about potential university development going forward. “Loyola has plans for the future and we want to have some input into those plans,” Blommaert said. The new dorm, St. Joseph’s Hall, named after St. Joseph’s University, a Jesuit, Catholic university in Philadelphia, will bring additional housing to first- and second-year students, The Phoenix reported. The project comes as Loyola’s class sizes continue to grow, putting a strain on existing residence halls. Construction is expected to take 18 months, according to an email sent by Residence Life to students living in Simpson, Regis, Seattle and Xavier and LeMoyne Residence Halls — the residence halls closest the the construction site on North Winthrop Avenue. Students living in the immediate areas surrounding the construction site can expect noise and dust over the next few months, the email said. Construction is slated to start at 8 a.m. though workers might be present on the site starting at 7 a.m. The email said that crews will be working on weekends depending on certain phases of construction. Residence Life asked students to reach out to them with construction-related concerns, according to the email. Loyola sophomore Audrey Palumbo lives in Xavier Residence Hall across the street from Alumni House. She said the demolition has been loud but hasn’t affected her too much. “It’s been loud, but Xavier [residence hall] is just as loud in the mornings,” Palumbo, a film major, said. Sophomore Karrington Jones said she sees the new residence hall as a necessary addition to campus. “I believe it is needed because it’s overcrowded in Loyola and I just hope Loyola uses the new residence hall efficiently,” the 20-year-old health systems management major said. She added it’s been difficult navigating the area surrounding Alumni House with the demolition underway. “It has put me in danger because I’ve had to walk in the middle of the street during heavy snowfall and dodging cars,” Karrington Jones said. Both Palumbo and Karrington Jones said they weren’t aware of Alumni House’s purpose. “I didn’t even know what Alumni House was about,” Karrington Jones said. “I’ve looked it up before, because it’s interesting, but I didn’t find a super clear answer as to what it was,” Palumbo said. First-year Maggie Jones, a political science major, said she’s disappointed to see the plans come to fruition. “Loyola had its mind set on [the demolition] which is unfortunate so I wasn’t surprised but it still was very disappointing,” she said. She added students should’ve been notified of the implications the construction would bring. 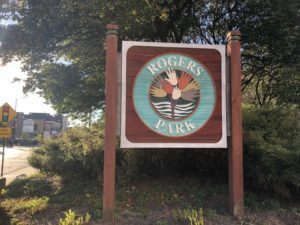 “I think that students should have been informed about what the process actually entails and how it affects the community,” Maggie Jones, 19, said. Despite the demolition, she said she’s still happy she’s at Loyola. “I still love going to Loyola but it was a disappointing fact to find out,” Maggie Jones said.